Dancers wearing straw hats, barkcloth loincloths (bagadi) and carrying spears with a wooden gong (gugu) and gong-player. Notes on card mount m/s pencil - "slight fading 11/11/86 EE"
(Witchcraft Oracles and magic among the Azande, 1937:101). E. E. Evans-Pritchard notes that 'Their great wooden gongs (gugu, also called borua) are Mbomu. A smaller kind, karakara...came from beyond the Uele. The skin drum (gaza, ndimo) is Mbomu." (Man and Woman among the Azande, 1974: 115-116) "..when I [the narrator] went through the settlements I told all the youths about the dance. Some of them told me "we have already heard the dance-gong, that which you beat in the morning." I said to them "all right, I am most eager to dance today." ... The master of the dance stayed away for a short time and then he came to where we were and saluted ... He then went to the homestead of the dance and mounted the gong there. All stopped dancing. He spoke to them thus 'it is I, Aramasi, who am giving this dance today to lament my younger brother with it. ... He then got down from the top of the gong. 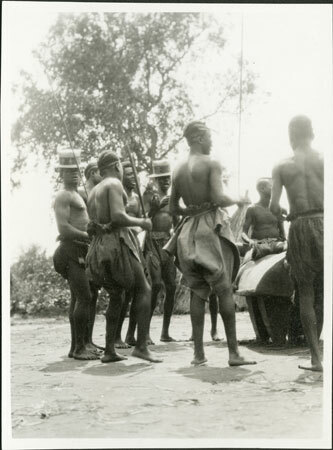 Balingbandali mounted the gong [to beat it] and Nambaga took possession of the drums... the dance began in full swing." Morton, Chris. "Zande men with drum and gong" Southern Sudan Project (in development). 03 Jan. 2006. Pitt Rivers Museum. <http://southernsudan.prm.ox.ac.uk/details/1998.341.3.2/>.